Having spent a week reviewing the performance-oriented, luxurious Lexus GS-F, with its glorious 5.0-liter V8 engine, we felt it necessary to experience a car on the other side of the spectrum in the form of the 2017 GS200t F Sport. Our mission was to discover if the GS with the smallest engine could live up to the F brand. Our test car came in Atomic Silver, a stunning color with a slight hint of gold hue that pairs beautifully with the brown Flaxen leather interior and Naguri aluminum trim. Lexus has tried to blend luxury and sportiness into the GS200t F Sport by using metallic materials mixed with soft leather. The GS200t starts at $53,980 in the F Sport trim, and our tester came in at $57,735 with a few options. The F Sport trim carries a premium over the $46,310 base price of the standard GS200t, although the F Sport options really spruce up the car. We had several people ask us if we were driving the GS-F, because the F Sport pack makes the car look almost as aggressive as the fully-fledged F model. Power is unchanged, like all F Sport models. The 2.0-liter four-cylinder turbo engine produces 241 hp and 258 lb-ft of torque going out to RWD through an eight-speed automatic with paddle shifters. This engine provides adequate power, but speed freaks will really want to step up to the GS350. The GS200t can hit 60 mph in 6.6-seconds, which is about 1.2-seconds slower than the V6 model. The four-cylinder does achieve better fuel economy at 21 city, 30 highway and 24 mpg combined. However, this is only marginally better than the more powerful 350 model, which achieves 19 city, 27 highway and 22 mpg combined. We didn't have any problems with the turbocharged engine in traffic. Lexus has tuned the engine to deliver power low-down in the rev range, so the car feels very smooth. When we dipped into the throttle, we noticed some turbo lag near the top of the rev range. Some of the car's lack of oomph can be attributed to the transmission. We love the eight-speed automatic, but it seems like Lexus didn't give the GS200t F Sport the same aggressive tuning that the 350 version has. F Sport models come with the conventional Eco, Normal and Sport modes, but also add a Sport + mode that is supposed to sharpen up the whole car. 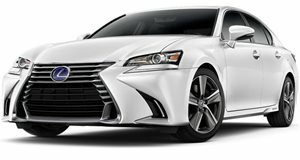 In the GS350 F Sport, Sport + mode tightens up the steering, puts the suspension into a firmer setting and tells the transmission to shift earlier for aggressive driving. When we put the GS200t into Sport + mode, we didn't get the same sensation that the car was changing personalities. The F Sport trim still comes with tuned adaptive variable suspension and variable gear-ratio steering, but neither seemed to be aggressive enough for our liking. Even in Sport + mode, the steering was incredibly light, the suspension was a bit soft and the transmission seemed to be in too high of a gear. The whole experience wasn't bad, just not the best F Sport experience that we have sampled. The GS comes with independent double-wishbone front suspension with coil springs and multi-link coil spring rear suspension with gas-pressurized shock absorbers and stabilizer bar. The GS is actually a well handling car thanks to 235/40R19 front, 265/35R19 rear Summer tires. Our tester also came with four-piston front calipers with 14.0-inch ventilated rotors and 12.2-inch ventilated rear discs with single-piston sliding calipers that were painted in orange for $300. The GS offered an extremely compliant ride that is excellent for long distances, but not for track use. Although, we doubt that many people will ever take their 3,800 pound luxury sedan to a track. On the inside, it's clear that Lexus is a bit behind some of the German automakers in terms of technology. However, all of the important stuff is there including a 12.3-inch navigation system with voice command, blind spot monitor with rear cross traffic alert, backup camera, automatic high beams, heated and ventilated seats and adaptive cruise control. Lexus also took one of our criticisms that we had with the RX's adaptive cruise control, and fixed it on the GS. The system can now handle stop-and-go traffic, without having to touch the pedals. You do have to trigger the system to resume after a long stop, but this car can basically be driven around without touching the pedals. The F Spot package also makes a big change on the gauge cluster of the GS. The standard GS comes with conventional dials, but the GS F Sport gets the digital tachometer that was first seen on the LFA. Unlike the IS and RC, this tachometer doesn't slide, but it does change colors when put into Sport and Sport + mode. The digital needle also shows were shift points take place and the whole dial lights up orange when the tach nears the red line. This cool display also comes with a head up display that can show speed, tachometer, navigation prompts and an eco meter. There is even a G meter and boost gauge that most owners will probably never use, but are fun to play with. We really enjoyed the GS F Sport as a cohesive package. This is a luxury sport sedan that leans more towards the luxury side, while offering extremely aggressive styling. We think that this segment is perfect for a car that has the aggressive looks of the $100,000 performance sedans, without sacrificing the comfort. Some enthusiasts may be more inclined to choose more sporty options like the BMW 530i or Mercedes E300, but load one of those up like the Lexus and they will likely cost almost $70,000. The GS remains a bargain in its segment, which is why we hope that the rumors to discontinue it turn out to be false. While we do love the GS F Sport as a midsize performance bargain, we would heavily recommend stepping up to the GS350 F Sport. 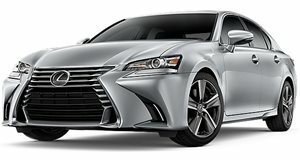 The GS350 comes with a 3.5-liter V6 that is good for 311 hp and 280 lb-ft of torque for just $830 more (comparing base prices). The V6 is only slightly less efficient than the turbo and delivers more linear acceleration. If you love the aggressive styling and plush interior of the GS, we highly recommend it. However, if you're looking for a more thrilling midsize sedan there are some better options. The GS remains a great value car because you don't have to go nuts with the option sheet, which cannot be said of some its competitors.